The U.S. Patent and Trademark Office has today published a patent application from Apple for a fuel cell system designed to allow a MacBook to operate without external power “for days or even weeks.” The patent was published shortly after a British company rumored to be working with Apple managed to fit a fuel cell battery into an iPhone 6, powering it for a week at a time. We first reported on that project last summer. There is, of course, no such thing as a free lunch, and fuel cell systems require the fuel to be replenished once it is exhausted, which the patent addresses by referencing removable cartridges. 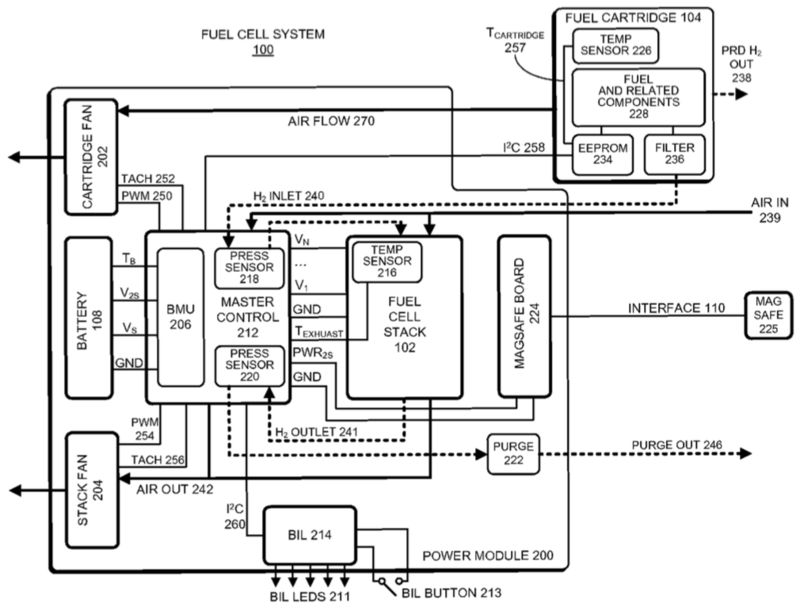 Apple is keeping its options open on the fuel used in the system. The most likely implementation would be a mix of conventional batteries and fuel cells, allowing the MacBook to be recharged in the usual way, switching to fuel cell power only when extended wireless use is required. As always, we note that only a tiny proportion of the things Apple patents ever make it into products, but I have to say that I really hope this is one of them.